Imagine if Christian churches were compelled to share Wiccan theology with everyone who came through their doors. Or, if the American Lung Association was forced by Colorado law to display information on where to purchase cigarettes. This is the type of situation California pregnancy centers faced due to a 2015 state law which required them to advertise state-funded abortion services in their waiting areas, which violate both their conscience and free speech rights. Further, non-compliance with the law would bring crippling fines. Left unchecked, our Colorado Springs Pregnancy Centers would likely face similar legislation. includes Life Network, filed suit in California to overturn the law. 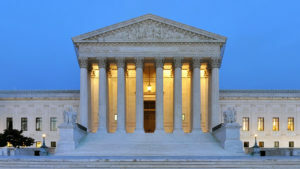 It went all the way to the Supreme Court and in a 5-4 vote on June 26, California’s attempt to restrict free speech rights was overturned. The decision protects centers like ours from being forced to repeat messages with which we fundamentally disagree. It is stunning to think we were a single justice’s vote away from potentially being forced to advertise abortions. Thank you for joining us in praying for this victory. Nearly every day, we see women who also have an appointment with our city’s abortion provider, Planned Parenthood. Their national data shows that they abort 200 babies for every one baby they support with pre-natal care. While referrals from Planned Parenthood are rare, we’re thankful for this opportunity to provide coaching and resources to Shannon. She’s joined 200 women who are currently participating in our LifeSteps parenting program. Because of your willing support, we can step in and help women and men at a pivotal time when the economic burdens of unexpectedly being a new parent are high. These parents receive maternity and baby clothes … a crib … a car seat … a stroller … and more by staying engaged with their coach in our parenting program, gaining insight that enables them to parent confidently. Thank you for your prayers and continued support to value the life of moms, dads and babies in our community!